Paris is one of the most popular tourist destinations in the world, with over 30 million foreign visitors per year. Besides the well-known landmarks as the Eiffel Tower, the Arc de Triomphe, the Notre Dame Cathedral and the Louvre Museum, the City of Light offers a wealth of other breathtaking, graceful and majestic marvels to behold. Below you will enjoy a list of the 30 most beautiful and must-see places in Paris. See also Top Museums in Paris and Top Fun Places in Paris for Kids! 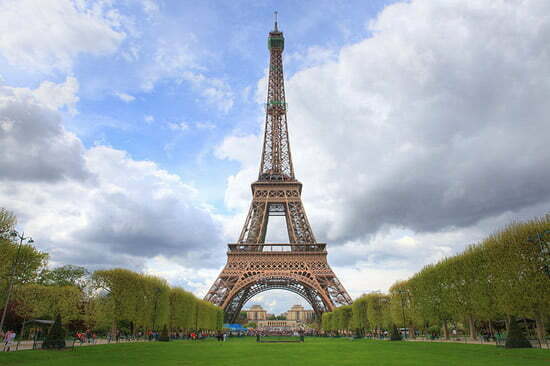 The Eiffel Tower is Paris’s most famous landmark and one of the most recognizable structures in the world. Visited by more than 5 million people each year, it is the most visited entrance-paying monument on the planet. The 300-metre-tall (984 ft.) tower was meant to last only for the duration of the World Exhibition in 1889. But despite all protests from those who feared that it would not fit into the architecture of Paris, it still stands today and it is actually hard to think someone visiting Paris without seeing this icon. 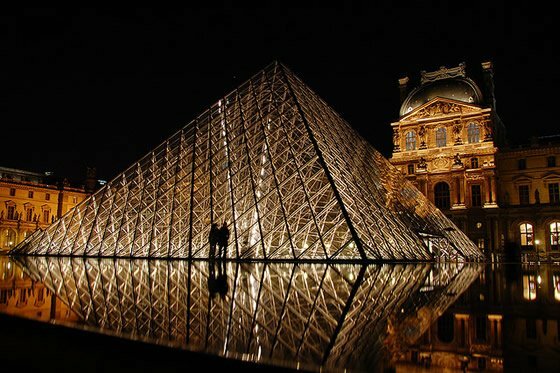 The Musée du Louvre is a must stop for those going to Paris. It is a retreat that appeals to both lovers of art, as well as to common people who, after a day touring the museum become art lovers. It is one of the greatest art museums in the world, with representative examples from almost every civilization on Earth. Its architecture is an artwork itself, where a giant 21-meter-glass Pyramid rises from the ground contrasting to the palace’s classical lines. 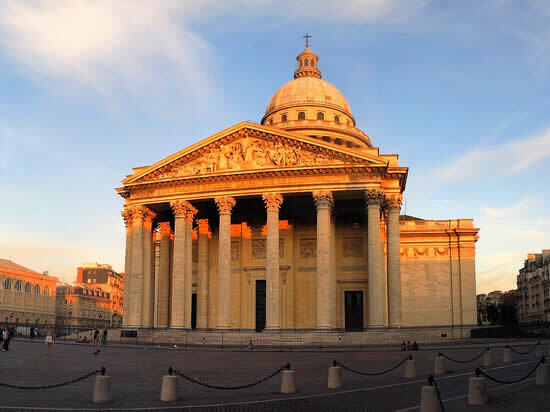 The Pantheon Paris is one of the most noticeable monuments of the city. Sitting atop Mont Sainte Geneviève, it looks out over the entire city. Once a church, today it is a mausoleum where martyrs and illustrious Frenchmen are buried. 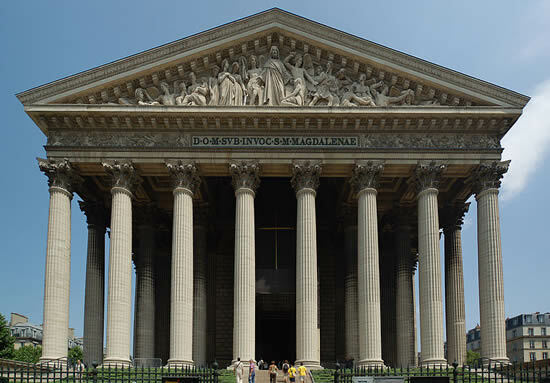 This is a vast neoclassic building, modeled on the Pantheon in Rome. It has a massive portico of Corinthian columns façade surmounted by a huge dome and a very ornate marble interior. 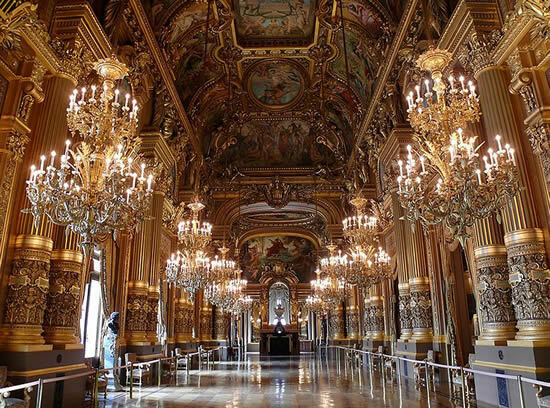 The luxurious Palais Garnier is one of the most famous opera houses in the world, partly due to its use as the setting for “The Phantom of the Opera” novel. The building is of exceptional opulence, vast and rich decorated with velvet and gold leaf. Some of its famous features include the gold Grand Foyer with its innumerous chandeliers, the 30m/98ft-marble Grand Staircase and the auditorium’s magnificent chandelier, which weighs more than six tons. The Moulin Rouge is the most famous cabaret in the world. Built in 1889, it is a legendary parisian landmark marked by the famous red windmill on its roof. 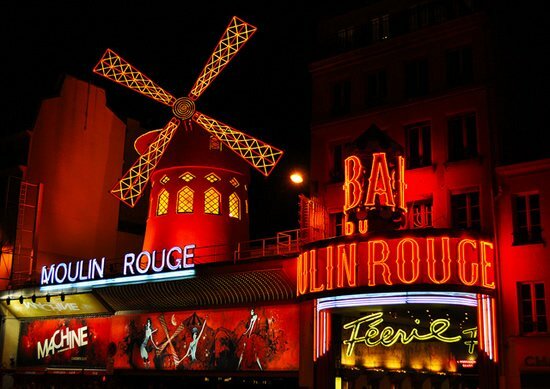 Best known for the can-can dance, the Moulin Rouge is a tourist destination that offers musical dance entertainment for visitors from around the world. The sumptuous shows are full of feathers, shinestones, sequins and beautiful girls. 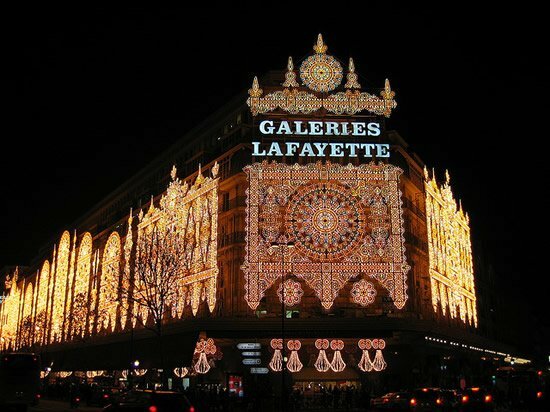 Galeries Lafayette is a must-stop for those who love shopping. It houses the most prestigious names in fashion, jewelry, cosmetics and home decoration. Housed in a stunning Art Nouveau building, this 10-story French department store worth the visit even if you don’t intend to shop. It is especially enchanting on Christmas, when a huge Christmas tree is placed under the famous coloured glass dome, and wonderful lights decorate the store inside and out. The Grand Palais was constructed in just three years and is best known for its enormous glass roof, which is the biggest in Europe. It is currently the largest existing ironwork and glass structure in the world: a beautiful combination of a classicist stone facade, art-nouveau ironwork and glass. 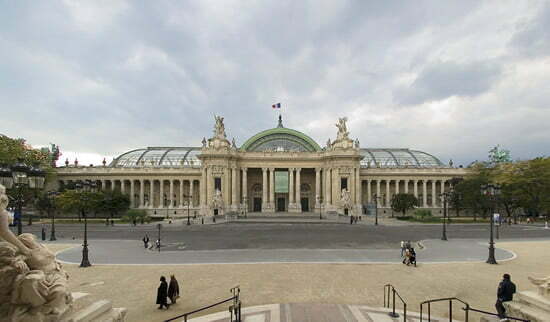 The building is separated into three distinct areas: an event hall, the Nef du Grand Palais, a science museum, the Palais de la Découverte and an exposition hall, the Galeries Nationales du Grand Palais. 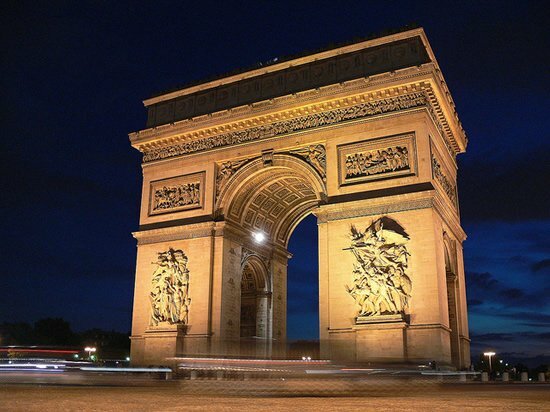 The Arc de Triomphe is one of the most famous monuments in Paris and the second largest triumphal arch in the world. It is located at the end of the Champs-Elysées, one of the most famous avenues in the world, and in the middle of the Place Charles de Gaulle, a large circular square from which 12 streets emanate. It honours those who fought and died for France in the French Revolutionary and the Napoleonic Wars. 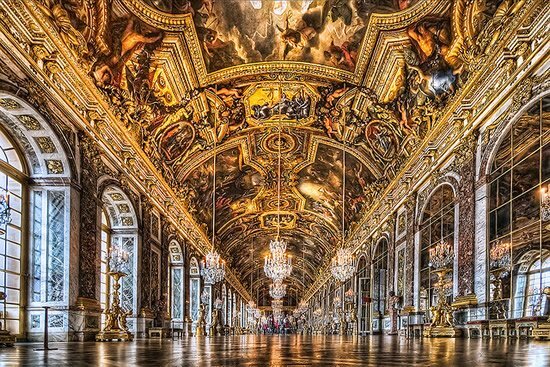 The magnificent Palace of Versailles was the official residence of the French kings from 1682 until 1790. The Palace and its magnificent formal garden became a model of the ideal royal residence for over a century in Europe. Its most notable features include: the ostentatious bedrooms, the Hall of Mirrors, the Royal Chapel, the Queen’s bedroom, the Geometric Garden, and the Latona Fountain. 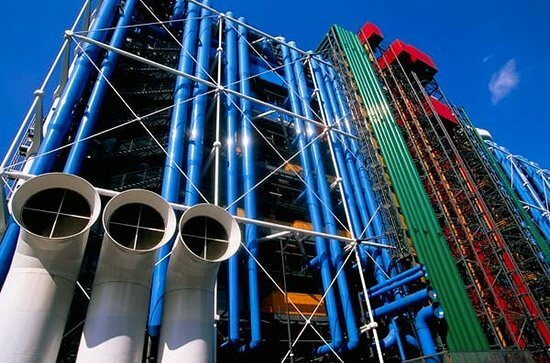 The Centre Pompidou houses Europe’s most important museum of modern art, the Musée National d’Art Moderne, and one of the world’s most significant art galleries. Completely focused on modern and contemporary creation, it broke with conventions by placing coloured functional elements such as escalators, water pipes and air conditioning to the outside of the building, freeing interior space for the display of art works. The Musée d’Orsay, one of Paris’s most popular museums, owns roughly 6,000 works of art, including the largest collection of impressionist and post-impressionist masterpieces in the world. 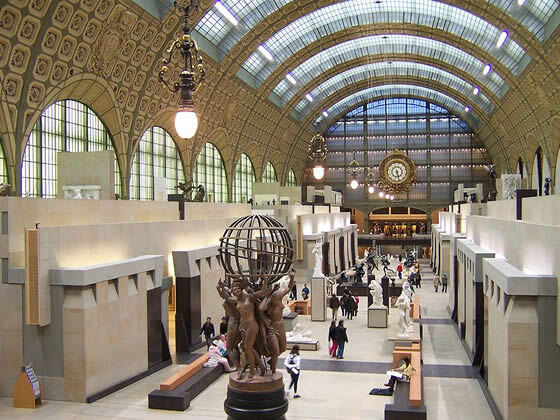 It is housed in an impressive Beaux-Arts railway station built between 1898 and 1900, which itself could be seen as the first “work of art” in the museum. The impressive building complex of Les Invalides is a masterpiece of French classical architecture. 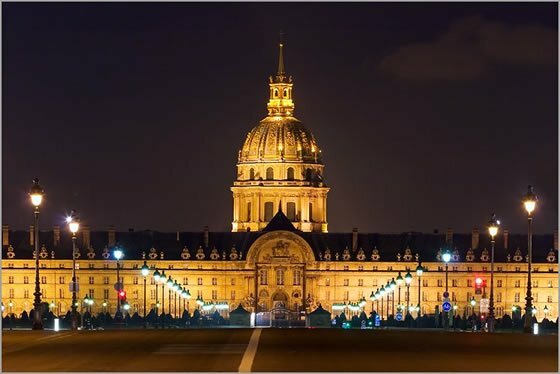 Originally built as a hospital and retirement home for disabled soldiers, it now houses four museums, all relating to the military history of France. The whole complex features 15 courtyards and a church topped by a 107-meter high (351 ft.) real gold dome, the Dôme des Invalides, which houses the Napoleon’s tomb. The beautiful Palais Royal currently houses several French’s government offices. Although the palace is not open to the public, you can visit the courtyard and the garden. 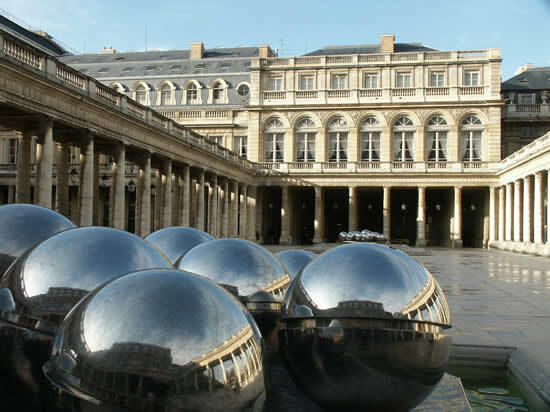 The courtyard, known as Cour d’Honneur, is dominated by a large sculpture by Daniel Buren, which consists of 280 black and white striped truncated columns, Les Colonnes de Buren. The palace’s garden is a quiet refuge in the heart of Paris formally laid out around a central fountain. 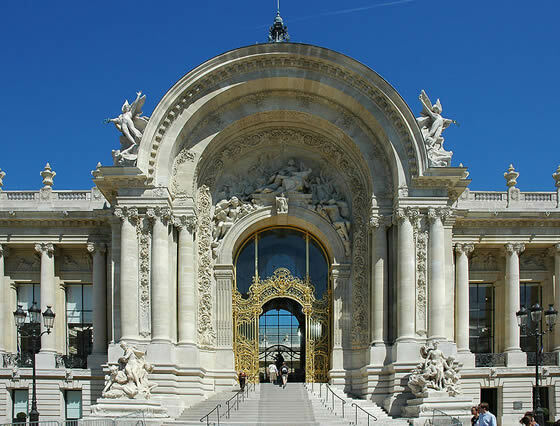 The magnificent Petit Palais became a museum in 1902 and now houses the Musée des Beaux-Arts de la Ville de Paris. The building surrounds a semi-circular courtyard and garden, with ponds and palm trees edged with mosaics and columns. It has a neo-baroque style with carved decorations in the walls, marble columns and walls. Its wide uncluttered halls and high rounded ceilings give the palace a sense of openness and freshness. 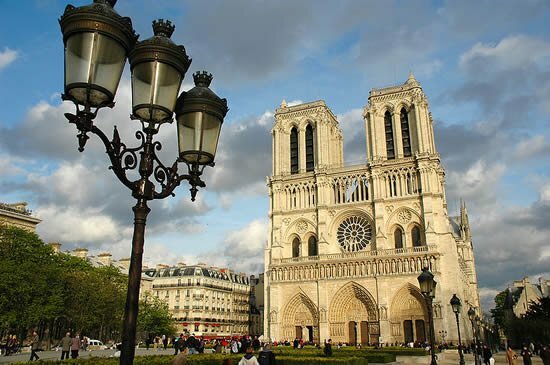 Notre Dame de Paris is a Catholic medieval cathedral considered to be one of the finest examples of French Gothic architecture in France and in Europe. Its construction took nearly 200 years, from 1163 to 1330. The cathedral is full of intricate details, massive rose windows and splayed flying buttresses that make its immense roof possible. Inside the spacious cathedral, which holds 6,000 worshippers, there is an incredible 7800-pipe organ. 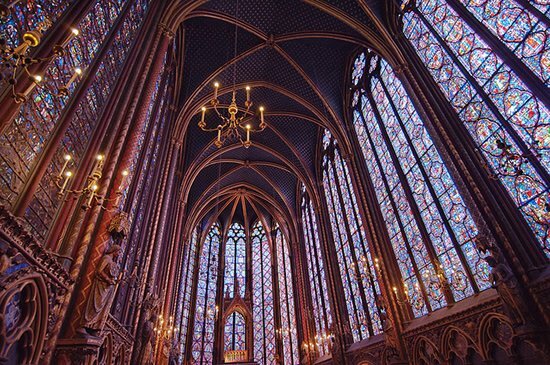 The Sainte-Chapelle is a masterpiece of Gothic architecture that was built during the Middle Ages to house Louis IX’s collection of Passion Relics of Christ, including the Crown of Thorns. The most famous features of the chapel are the tall stained glass windows, which comprises 600 square meters (6,456 sq ft) in area, and the wonderful statues of Jesus’ twelve apostles. 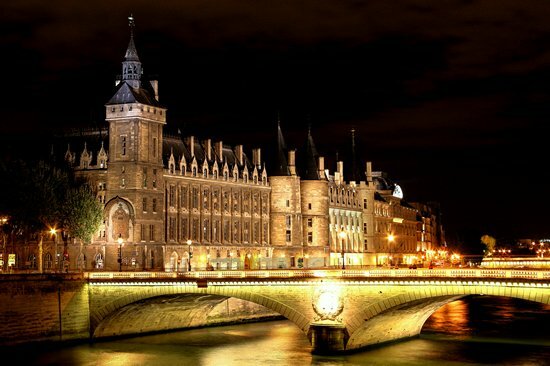 The Conciergerie is a very historical monument that includes the remains of the Palais de la Cité, the first royal palace in Paris that was turned into a prison during the French Revolution. 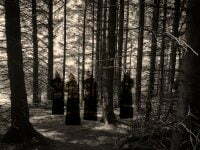 With its impressive Gothic architecture, it still retains the hideous character of feudal times. Only a relatively small part of the building is open to the public as a national historical monument. 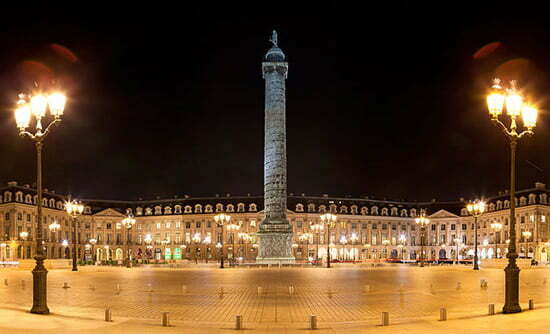 Place Vendôme is a prestigious square created as a monument to the glory of the armies of Louis XIV. The column in the center of the square was erected by Napoleon to commemorate the victory at Austerlitz. It has reliefs depicting scenes during the Napoleonic Wars between 1805 and 1807 and is topped by a statue of the emperor. The Place Vendôme has been renowned for its expensive hotels such as the Ritz as well as retail stores of famous jewelers and dress designers. 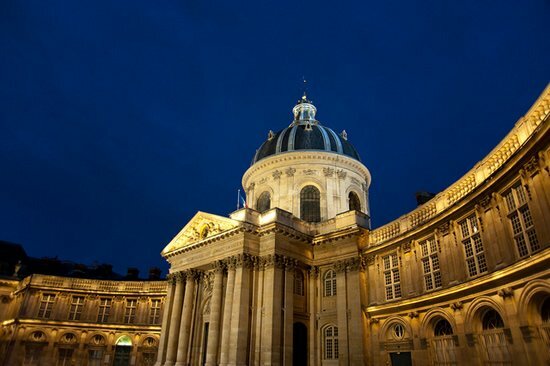 The Institut de France is a French learned society grouping five academies, the most famous of which is the Académie française. This monumental palace is a precious example of French Baroque architecture. One particular feature is its semicircular facade, with a six-column portico behind which is the dome of what was originally the chapel that was converted into the large council chamber in which the academies and the Institute as a whole meet in plenary session. 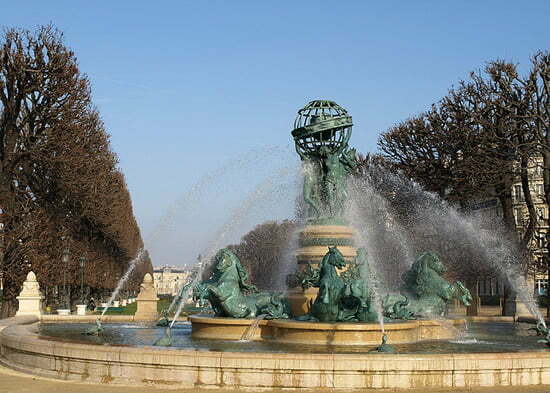 The Jardin du Luxembourg or the Luxembourg Garden is the largest and, probably, the most famous park in the Paris. At the center of the park is an octagonal pond where children can rent toy boats. The lawns and alleys are all laid out in a geometrical pattern and beautifully adorned by statues, flowers and fountains, including the Fontaine de Medicis and the Fontaine de l’Observatoire. The park also offers open-air cafes, as well as activities for children, like poney rides and playground. 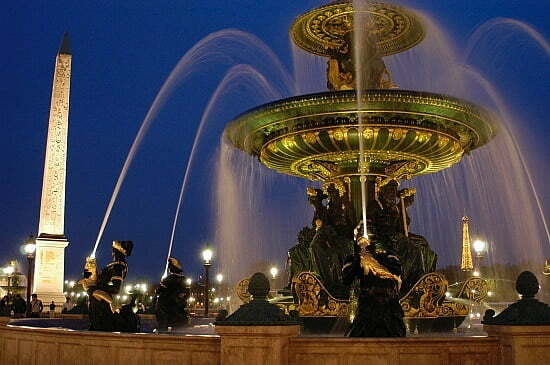 The octagonal Place de la Concorde is the largest square in Paris. At each one of its corner is a statue representing a French city. In the middle of the Place stands the giant Egyptian Obelisk of Luxor, a red granite column 23 meters high that is between two incredible beautiful fountains, one devoted to the Rivers and the other representing the Seas. The Parc de la Villette is an ultra modern gigantic (35 hectares) park that leads us to experience and interact with nature, art and technology. This open space park, with no gates, no fences enclosing it, has very large grassy areas and a collection of twelve themed gardens. 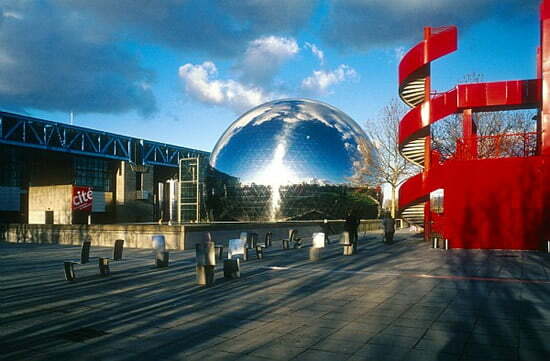 It is home to the Cité des Sciences et de l’Industrie, the biggest science museum in Europe, which presents a host of attractions combining science and interactive leisure activities. 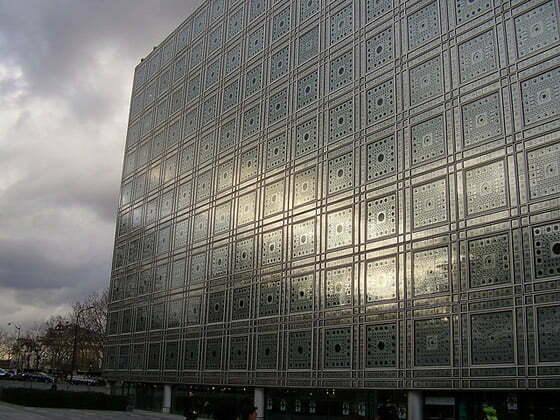 The Institut du Monde Arabe displays different aspects of Arab Islamic art, including ancient manuscripts, beautiful silk carpets, pottery and scientific and astronomical instruments. Its south facade reinterprets traditional Islamic architecture with 30,000 light-sensitive metallic diaphragms designed to regulate the penetration of light into the building. 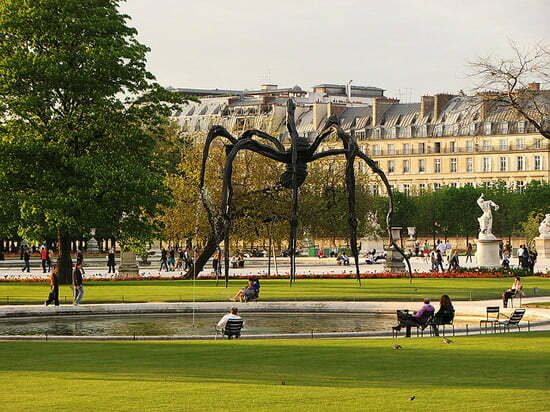 The Tuileries Gardens or the Jardin des Tuileries is a park in Paris that features 25 hectares of greenery, plants, flowers, a large collection of sculptures, several fountains and two museums. The park provides lots of kids’ activities, such as donkey and pony rides, marionette puppet shows, beautiful ponds with ducks to feed and miniature sailboats, traditional carousel and adventure playground. 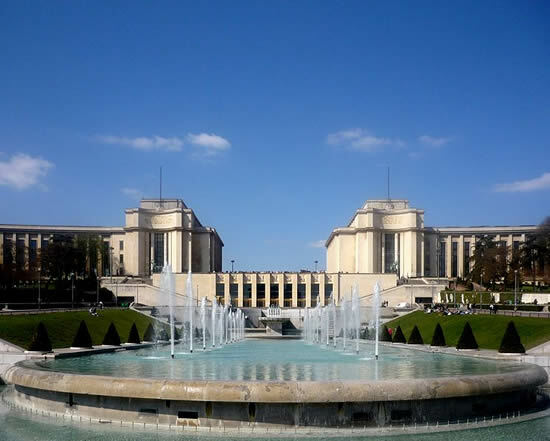 The Palais de Chaillot is a monumental building that houses several museums, an aquarium and a theatre. It is composed of two large curved buildings, separated by a wide, marbled and elegant plaza that allows visitors to catch an open view from the Place du Trocadéro to the Eiffel Tower. At the foot of the terrace of the Palais de Chaillot lie the Trocadero gardens, which are laid out around a large rectangular pond especially spectacular at night, when Paris’ largest fountain is lit. 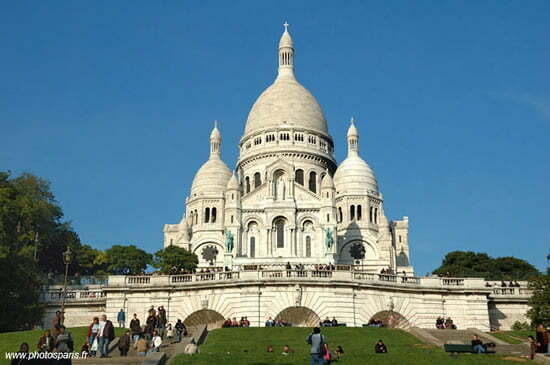 The Sacré-Coeur Basilica is a majestic immense building in Roman-Byzantyne style located on top of the Montmartre hill. Due to its location on the highest point of Paris, the basilica is one of the most noticeable landmarks in Paris. It is built of travertine stone quarried in Château-Landon. When it rains, the stones react to the water and exude calcite, which acts like a bleacher and ensures that the basilica remains white even with weathering and pollution. The Madeleine is an enormous church built as a Greek temple. It was designed as a temple to honor Napoleon’s army. However, the Arc de Triomphe assumed this commemorative role instead, and in 1842 Madeleine was finally consecrated as a church. Outside, 52 Corinthian columns surround the enormous building. Inside, the church has a single nave with three domes over wide arched bays, and behind the altar is a large statue depicting the ascension of Mary Magdalene. 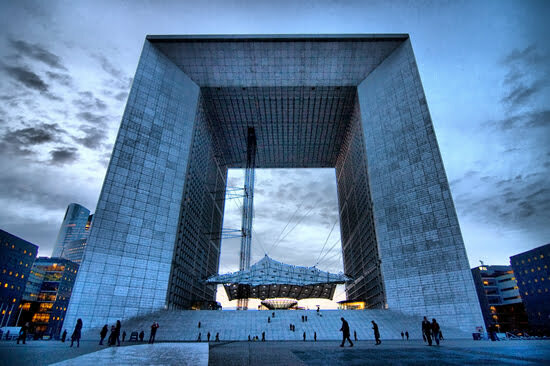 The Grande Arche de la Défense was intended to be a XXth century version of the Arc de Triomphe, and is almost three times the size of its more famous sister. This modern triumphal arch is actually a 35-story office building and forms an almost perfect cube made of white marble, measuring 108 meters deep, 110 meters high and 112 meters wide. You can take an elevator to the top of the monument, from where you have panoramic views of Paris. 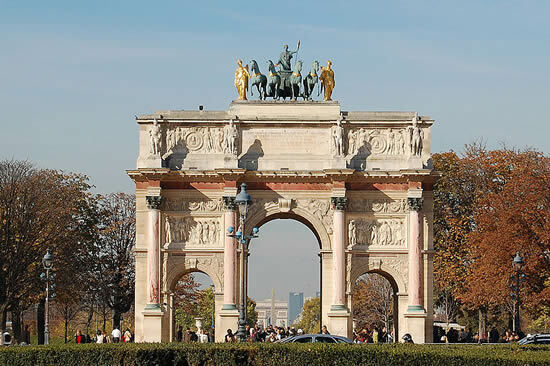 The Arc de Triomphe du Carrousel is the smallest of the three arches on the Triumphal Way in Paris, built between 1806 and 1808 to commemorate Napoleon’s military victories of the previous year. It is composed of three arches: a big one and two little ones, richly decorated in beautiful rose marble which adds dramatic touches of color at different times of the day. The top of the arch is ornate with a chariot with a team of horses. 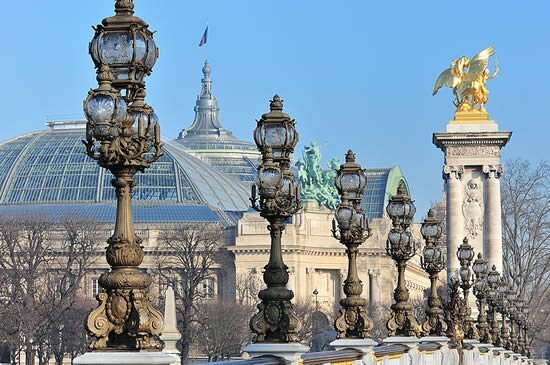 The Pont Alexandre III is the most ornate and extravagant bridge in Paris. It is richly decorated with lamps, cherubs, nymphs and winged horses. On each end of the bridge, large gilded statues of Fames on 17 meters (56 ft) high granite pillars watch over the river. Connecting the Grand Palais with the Hôtel des Invalides, it consists of a six-metre high single leaf arch that spans the Seine in a great curve, although not obstructing the view of the Champs-Elysées or Les Invalides.